What could be more refreshing on a warm day than a fruity little drink? A fruity tall drink! When I got home from work today I decided that I needed a fruity tall drink, so I decided to create one. Since strawberries are in season right now where I live in Minnesota, and I have been buying them by the case, I thought they would be perfect in a drink! I combined them with a bit of tequila, and framboise as well as some lemon for tartness and vanilla and agave nectar for sweetness. I served it on the rocks and topped it off with a bit of fizz for fun! This drink is a great cure for a long day at work! Combine Strawberries, tequila, framboise, lemon juice, vanilla, and agave nectar in a blender and process until strawberries are liquified and all ingredients are well combined. 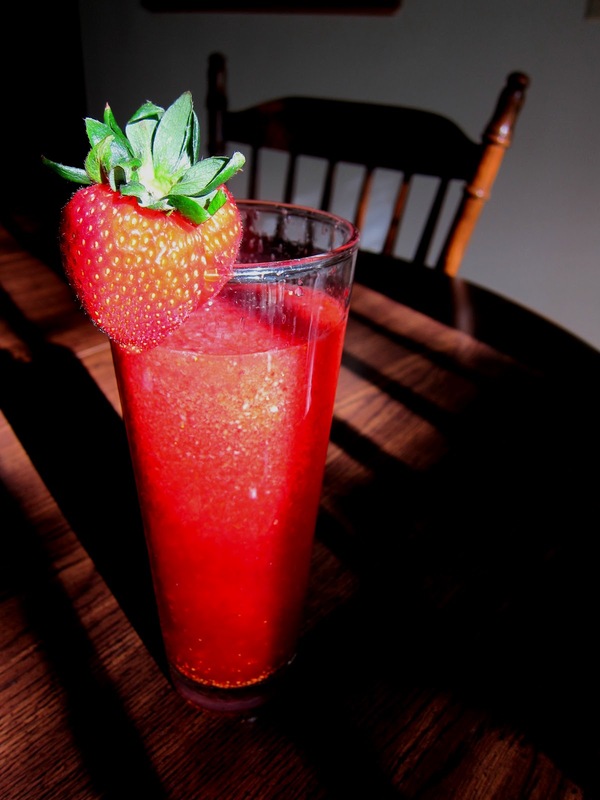 In a large tall glass, place a few ice cubes, and pour strawberry mixture over. Top off with a bit of sparkling water and garnish with a strawberry...enjoy! I want one RIGHT NOW! Mmmmmmmmm! I don't have Framboise, but will figure out something else to throw in the mix so I can say cheers right along with you. I could go for a whole pitcher! Oh man does THAT look good. The alcohol just adds to the goodness. I must try one! Yummm! That looks so good! I've been off alcohol since I became pregnant and I'm craving that fruity tall drink! This sounds great--fresh, fruity with the tipsy factor. Love!